By Herbert Johnson of New Bond Street, London. Large size - approximately 71/2 (physically measures 59cm). 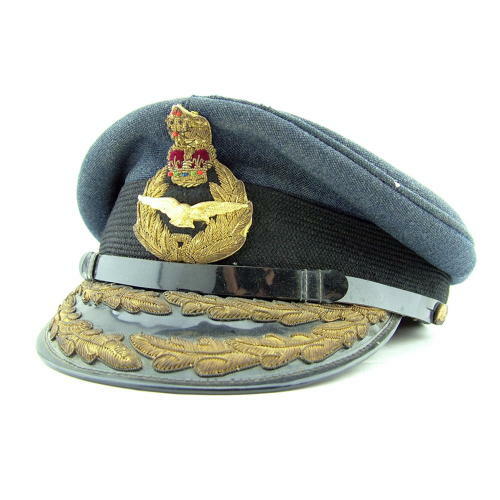 An 'Air Rank' service dress peaked cap dating from the mid 1980s. This is generally in good condtion although well used and it does has some soiling and fading with light moth trailing on the crown and loss of fabric around the crown piping. Very nice Queen's crown bullion badge and peak with distinctive double row of heavy bullion leaves. Lined in tan satin with a greasepaper protection sheet. The maker's crest/details visible beneath through a small tear in the greasepaper. The inner leather band is good and has the original owner's name marked on the innerside. We purchased this directly from the veteran who was commissioned into the RAF in 1957. After flying tours in high and low-level bombing roles on IX Squadron Canberra B6s at Binbrook and Coningsby, and 49 Squadron Valiants at Wittering and Marham, he served as a Valiant/Victor instructor. He was a founder member of the Tanker Training Flight and took up an Air Staff weapons appointment at HQ Strike Command in the late 1960s flying weapons trials with the USAF in F100, F4C, F4D, F105, and Hunters. He also flew a He111 and Me109 during the making of the classic Battle of Britain film. Later he flew Vulcans and spent 3 years at the MOD in Whitehall as Deputy Principal Staff Officer to the Chief of Defence during the Falklands war. After helicopter training he served as Commander RAF Hong Kong and later still as Deputy Commander British Forces and Chief of Staff in the HQ British Forces Gibraltar and Commander Air Gibraltar. He left the RAF as an Air Commodore in 1993. The moth damaged crown is a shame but overall this in in reasonably good order displays well and does have history. A rare cap. Stock code U19096.